How they were discovered: Cherri Bomb – Live! Starring ... You! 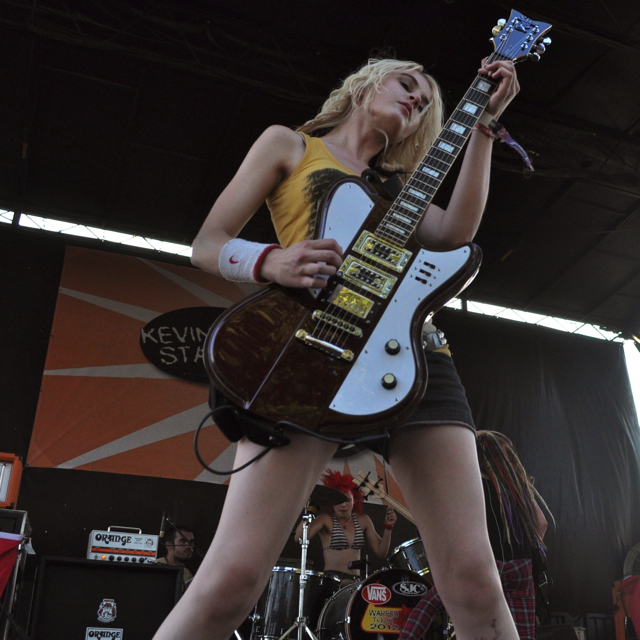 Cherri Bomb guitarist Miranda Miller performing on Vans Warped Tour in summer 2012. Editor’s note: This is first in an occasional series of stories that will detail how performers earned their “big breaks” or got “discovered.” As often happens in show business, the story changed from the time we wrote it until now. In this case, one of the members of our subject, the band Cherri Bomb, left the group. (That announcement was made today.) That said, we’re still bringing you the story, because you can still learn what steps Cherri Bomb took to get noticed and step up their career. With this story and those that follow, we hope you can become inspired to find new ways to chase your dreams, too! Star subject: Cherri Bomb, a California-based rock band signed to Hollywood Records. Members are guitarist Miranda Miller, 16; bass guitarist Rena Lovelis, 14; and drummer Nia Lovelis, 15. 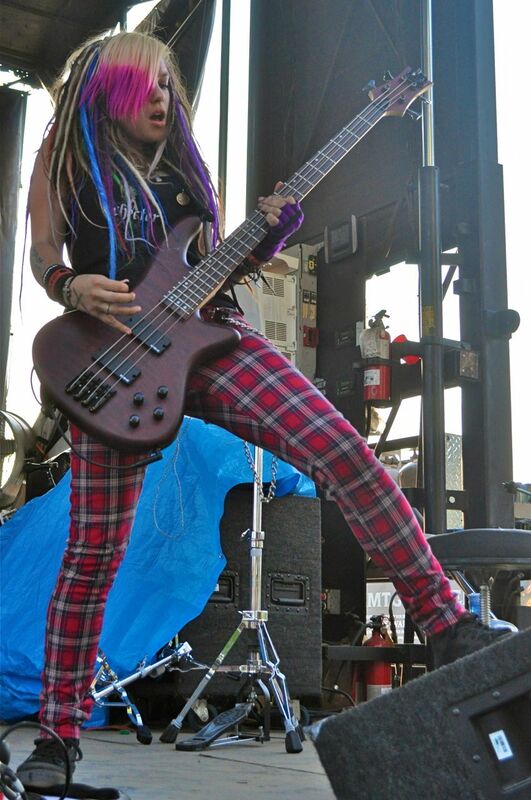 Just today, Cherri Bomb announced that guitarist Julia Piece, 15, is leaving the band. She found them, though: Miranda was a classical piano prodigy – she started playing at age 4! – and proved herself an equally skilled rhythm guitarist. Sisters Nia and Rena, who parents were music industry veterans, also joined up and the lineup was complete. 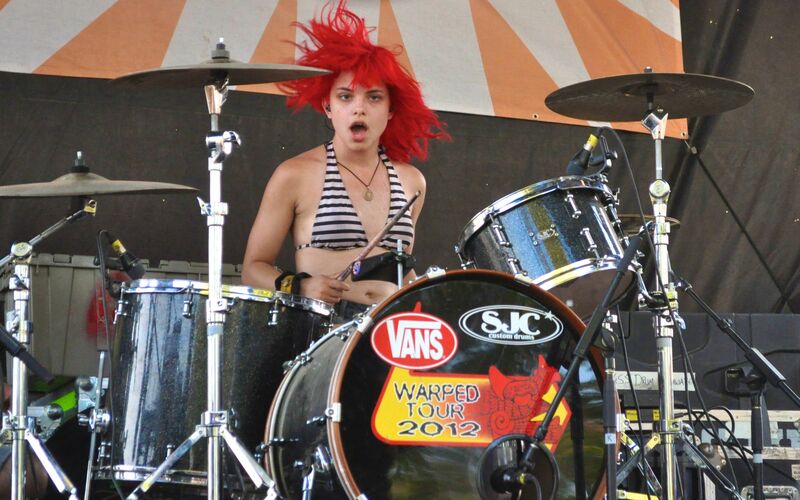 Nia Lovelis keeps the beat for Cherri Bomb on Vans Warped Tour 2012. Turning points: Cherri Bomb’s big break was actually triggered by a parental connection. Rena and Nia’s mother, Anna Lovelis, is a singer/songwriter who worked in New York years ago with rock drummer Samantha Maloney. After Cherri Bomb got started in L.A., Anna asked Sam (who was also now in L.A.) to listen to check them out. Sam liked the Cherri Bomb so much that she asked them to open for her band at the L.A. music hot spot, The Roxy. Impressed as she was, she still thought Cherri Bomb needed another year to develop before trying to land a record deal. The girls took Sam’s advice and spent the next year perfecting their music. One year later, they circled back to Sam, who was then drumming for Billy Ray Cyrus. (She’s also played with Mötley Crüe, Hole and a bunch of other big-name acts.) Sam realized Cherri Bomb was ready to rock on the big-time stage, so she signed on as their manager and helped them land a record deal with Hollywood Records. Today, Sam guides every aspect of Cherri Bomb’s career, from fielding TV offers to setting up tours to trying to get the girls’ music on the radio. Rena Lovelis, with sister Nia and friend Miranda Miller, is one-third of Cherri Bomb. It’s no coincidence that the girls of Cherri Bomb have all been playing since they were young. It takes years of hard work (most experts say 10 years) to become great at something. By starting young, these girls got a head start. How have you gotten a head start? How could you start something now? Cherri Bomb used their connections (Anna Lovelis’ friendship with Samantha Maloney) to create opportunity. Not everyone has musical parents, and not all parents will have musical connections. But if you play live and put your material online (with your parents’ permission), and ask friends and family to spread word, you never know who’ll see your work. What can you do NOW to get your work out there? It’s important to note that Samantha Maloney didn’t decide to help Cherri Bomb because she was friends with one of their parents. She learned about the band because of her friendship, but she chose to help the band because they were talented, motivated and passionate. Are you good enough – and do you work hard enough – that someone would want to help you right now?